Best Overhead Doors does not recommend installing your garage door by yourself. USE THESE INSTRUCTIONS AT YOUR OWN RISK. We do not guarantee and are not liable for you following these instructions. Your garage door’s manufacturers’ instructions will tell you how to remove it. Usually, you need to unlatch the door from the pulley system very carefully, taking apart the garage door panels, and then unscrewing the garage door tracks. Each panel should be removed carefully one at a time so they do not fall on you. First, measure the height and width of the garage door opening, the top of the opening to the ceiling, and the length of the garage itself. The top of the opening to the ceiling should be 10 to 12 inches, and you should have the measurement of the door height plus 18 inches at least as the length of the garage. Using these measurements, attach stops to the sides of the garage door opening making sure that they are even with the inside edge of the door jamb. Lay the bottom panel of the new garage door on sawhorses to attach weather stripping if necessary. Also attach lift handles and any hinges. Fit the bottom garage door panel into the door frame using a level. Partially tap nails into each door jamb. Bend the nails slightly to secure them. Follow the new garage door’s manufacturer’s instructions to assemble the vertical, horizontal and curved pieces of the track and put the assembled track to the side. Place the second garage door panel on top of the bottom one, and hammer nails into the side jambs to hold in place. 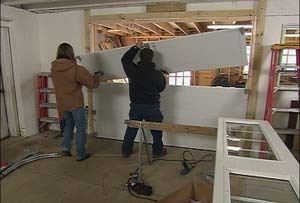 Install the hinges to the panel and repeat the process for the rest of the panels. Each garage door panel needs to be anchored into the door jamb. Once all the garage door panels are secured, install the rollers into each panel section’s roller supports. Place the rollers into the assembled track securing the brackets. The rollers should not be pressed too tightly against the track. If they are too tight, the friction can cause damage to the garage door. Make sure the vertical tracks are secure on the jambs. Install the curved track and horizontal track pieces. The horizontal tracks should be level and straight, pointing away from the garage door opening at 90 degrees. After securing the tracks, follow the manufacturer’s instructions to assemble the garage door springs. You will need a helper to lift the door halfway to ensure that the tracks are level and parallel. After they are level and parallel, lift the door all the way and attach the garage door springs to the pulley system.